To anyone who has just joined in, this is the final lap of a Roundup of the monthly food event Bread Baking Day #15. You can find the first part of this roundup at A Roundup of Festive Breads: BBD #15 and the second at BBD #15 Festive Breads: Second Helping. Here I being with Jude's contribution - Dan Lepard's Stollen Recipe via The Guardian. Jude says that this recipe for an extra moist Stollen may be lengthy, but they come together easily and there is very little kneading. What Jude loved best was placing the marzipan in the dough!! Do stop by at Apple Pie, Patis & Pate for a slice of this beautiful bread. Elizabeth prepared a lovely Festive Bread for Christmas breakfast. Elizabeth decided to skip the saffron in her bread this year and made a sweet six-strand bread to serve with hard-boiled eggs. 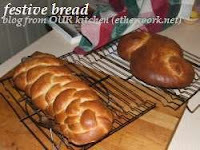 for some wonderful tips on getting this bread right, stop by at Blog from OUR Kitchen. Cheesy Herb Challah with Masala Cola!! Talk about tickling the taste buds and experimenting with food. That's exactly what Navita proposes to continue doing as she steps into the New Year. Find this lovely treat baked by Navita on her blog Zaayeka. Natalia's friend had her family visiting from England for the holidays. They asked Natalia if she could bake a Vegan Panetonne for them. And as Natalia adores challenges, that is exactly what she set out to do. Visit her blog gatti fili e farina for this recipe. 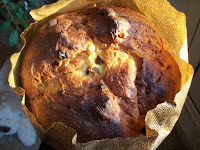 Miriam baked a beautiful bread - Il Pandoro - Simili for Bread Baking Day #15! 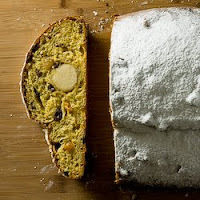 This is a perfect festive bread as it is not only pretty, but the Pandoro is a delicious bread. Its sure to please all your family and friends when they bite into it! For a more detailed recipe, do visit Miriam's blog at Chaosqueens Kitchen. Stefan of Der Suppenkasper blog baked an exquisitely beautiful Neujahrsbretzel - New Year´s Pretzel. Do visit his blog for this and two other beautiful breads baked by him for the festive season this year - a Six Point Star, and a Hungarian Ring Bread!! Temperance from High on the Hog shares her Grandma Skinner's Bread for All Occasions. Temperance says they would receive one of these beautiful prepared loafs from her every year for Xmas!! Now that she has the recipe too, Temperance bakes this bread annually in her own home on festive days! Peek in for a delicious recipe, perfect for sharing with friends and family alike!! 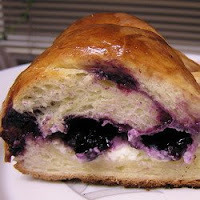 Jacqueline of Toxo Bread baked a truly festive Blueberry Cream Cheese Braid for dessert on New Year's Eve. She says that while this may not be a traditional holiday bread, it sure has great appeal. Her family loved it and I am sure we all give her the 'thumbs up' from too. And finally, my humble offering to this lovely food event. 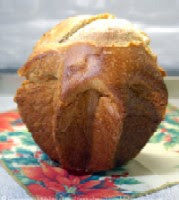 I baked a simple aniseed flavoured bread - the Vasilopita or St. Basil's Day Bread! For the beautiful story behind this bread and a recipe, join me at Annarasa. Once again, thank you all for making this event such a success. I really enjoyed hosting BBD #15: Festive Breads. The next Bread Baking Day is hosted by Temperence of High on the Hog. Do visit her blog for the theme for January. I have covered all entries that made it to my inbox. If you did send me your entry and it is missing from this roundup, kindly alert me at annarasa[at]gmail[dot]com. and I will add your entry. Amazing variety! Great job done Apu! what a beautiful roundup..great one..sure am bookmarking this one! What a wonderful roundup! Thank you for hosting BBD! Thank you so much for doing BBD#15,I enjoyed participating. See you on next months! Great round-up with delicious laves. I'm sorry I missed it this time. Well done, & have a great 2009! Thanks for visiting my blog. See you on the next BBD! I loved hosting BBD. Your enthusiasm and participation ia much appreciated. Thanks again for participating! I really enjoyed doing the roundup.